Introducing my ball machine Lithium. It has 2 lifts including Keggore1's car lift and ChassisDude98's Quarter Arm Lift. I have modified Keggore's car so that it can work on the thin and thick roller coaster track. If you want your car to have better grip than use the thick roller coaster track, but if you want it to turn easier use the thin roller coaster track. The angle I used is the steepest possible angle the car can climb. Lithium also has 6 tracks and 6 new elements. It also contains martb95's spiral panel stairs. All of the new elements (including martb95's spiral panel stairs) will be posted on my guide plus a few extras. So be sure to check it out. Lithium is the biggest project I've ever made instructions for, so if you have a question or are confused about something please leave a comment. If you like it please vote for it in the Toy Contest. Enjoy the video. p.s. The first song is by me. If you don't know what part I'm talking about refer to the pictures. p.s. On pieces exceeding the hundreds I can't guaranty an exact piece count. The track is what the cars will run on. The bottom turns are the ones that don't have the grey rod, the top ones do. The support towers will... uh... support the track. First you will build the left one. Then the right. And finally the middle. This lift was originally built by CassisDude98. I just modified it a little. My ball loader is a bit different then Keggore1's. Both the left and right side contain 3 levels. The right side is almost the same as the left. Just a couple extra supports. The green tunnel part is not a necessity. It just makes it look cool. 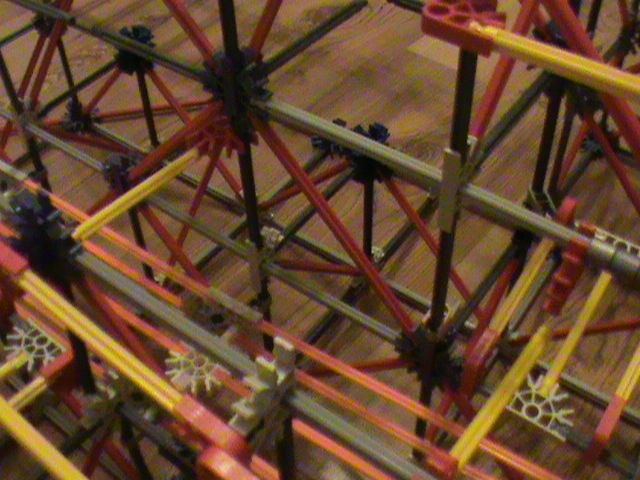 You can use thick or thin roller coaster track. You may have to trim it a little shorter once you put it on. You can build as many cars as you want. If your using the older boxier motors make sure you take off the battery covers and put some tape around it so the batteries won't fall out. Congratulations! Now that your all done throw some balls in it and have fun watching the cars pick them up and take them up the hill. Remember to check my guide out for those new elements. Hope everything was clear enough. Imade it! It was awsome. I don't have enough pieces to make this, but I think that this is the best knex ball machine on instructables with instructions. Congrats on winning in the toy contest! Hi! I'm excited and getting through building this. I would like a closer look at the lifting arm please, I don't know what's off the screen to the left of this picture. Or did I miss it? Huh? That's odd. I guess I forgot about that. Do any of these help? nice music thanks for the message! my hill doesnt connect. any suggjustions? Is it to short? Maybe could you give me a bit more of info on what is happening or post a picture? Honestly, I don't know. I've never tried it. are those tan coaster pieces bendable? YEAH!!!!!!!!!!!!!!!!! did you make instructions!!!! What could i do if i don't have enough orange connector during the track part? Make something like this for the straight parts.